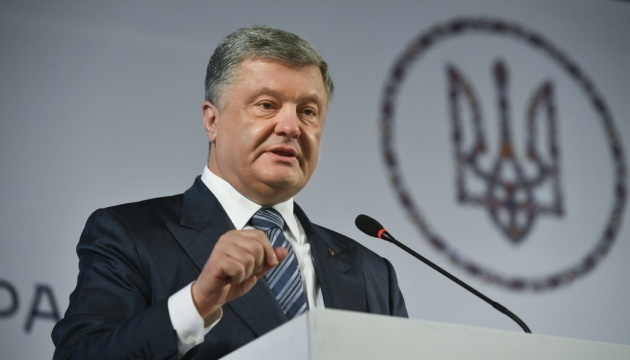 President of Ukraine Petro Poroshenko is convinced that Ukraine will not retreat from the path towards membership in the European Union and NATO, and Ukrainians will make a responsible choice during the elections to confirm the chosen path of the country’s development. He made a corresponding statement during a working visit to the French Republic, the press service of the Head of State reports. "Of course, everything is possible, including the change of attitude, if Ukraine behaves irresponsibly and if the decisive direction of our path to the EU and NATO is questioned, delayed through certain steps, including through referendums. When Ukraine itself does not demonstrate the resolve of its move forward," Petro Poroshenko said during a live broadcast on Inter TV channel, answering the question whether things could change in the relations between Ukraine and the EU after the elections. "As of now, I can emphasize that during all the meetings, the leaders of Europe thanked me as President for the brilliantly organized election process during the first round," Petro Poroshenko emphasized. According to him, the number of foreign observers in the elections, including from France and from Germany, exceeded 2,300 people. "And the general report on the results of the elections was that those were exemplary elections, that Ukraine never held elections with such a level of democracy, that they are completely satisfied with the protection of the will expression of the citizens and hope that it will be possible to hold the elections on April 21 at the same level," the Head of State noted. At the same time, Petro Poroshenko noted that during the campaign there were tough discussions and expressed hope that we would manage to avoid provocations. "This causes indignation, including of our international partners, if provocateurs try to disrupt holding of certain election events," he said. "I firmly believe that we will have an opportunity to inform Ukrainian citizens of the candidates' programs, so that they have all the conditions for a clear definition of the future for Ukraine, the future for themselves, the future for their children… I firmly believe that this future lies in the European vector of development of our state. That we will not stop halfway. No one will turn us back and return to the previous conditions when we were a colony of the Russian Federation. A free Ukraine will certainly not allow doing that," Petro Poroshenko summed up.